Rubbermaid Soft Molded Wastebasket - 7 gal Capacity - Rectangular - 15.0\" Height x 14.1\" Width x 10.3\" Depth - Plastic - Black - Welcome to TABS! 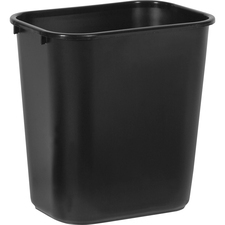 Deskside wastebasket is durable and easy to clean. Wastebasket will not mar furniture or floors. Deskside wastebasket is durable and easy to clean. All-plastic construction won't chip, rust or dent. Rolled rims add strength. Wastebasket will not mar furniture or floors. Green Compliant: Yes Height: 15"
Shape: Rectangular Width: 14.1" 14,1"